Home to the world’s most generous parental leave, the best places to go in Stockholm have to be baby-friendly. From history to futuristic modernity to easy access to nature, Stockholm is a great place to visit with family. Sweden is a paradise for families, and Stockholm one of the world’s top destinations when traveling with kids. Almost everything is child-friendly and accessible with a pram. Even if you do find yourself having to navigate a flight of stairs, many a passer-by will gladly help. Public facilities all have electric doors making entering and exiting a breeze; restaurants are mostly spacious and offer highchairs for children and a place to park the pram. What is there not to love about Stockholm? Stockholm is a city on the water. Despite the extensive suburbs stretching out to the north and south of the city, the defining feature of the city is the intersection of the huge Lake Mälaren with the Baltic Sea. What to see in Stockholm depends largely on the weather and the season, but the options are extensive. With the Complete Bébé Voyage Stockholm Travel guide, you’ll gain access to the best things to do in Stockholm with kids (and babies), Stockholm visitor attractions and activities for families, as well as an airport map that pinpoints family amenities in airports around the world and an interactive customized Stockholm map with our community vetted restaurants, parks, indoor playgrounds in Stockholm and more. 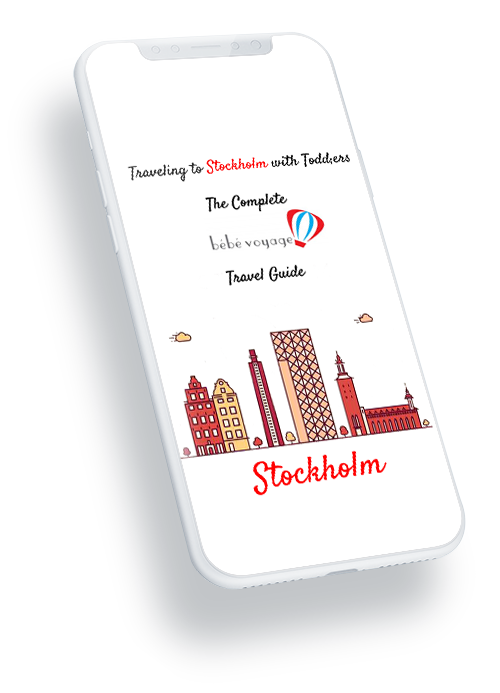 GET MY STOCKHOLM GUIDE BOOK NOW! Follow Bébé Voyage’s co-founder, Marianne, and Stockholm ambassador Jessica, as they take you around Östermalm, one of Stockholm’s poshest neighborhoods, and shows you its baby friendly side. This is a tour that you can realistically do in a day with a young kid and is fun for the whole family. FOLLOW IN A STOCKHOLM MOM’S FOOTSTEPS! Get the inside scoop on things to do in Stockholm with kids and other family-friendly Nordic countries. The oldest part of Stockholm, Gamla Stan, the small island straddling the huge lake Mälaren and the Baltic Sea, is one of the best preserved medieval city centers in Europe. This is probably because Stockholm is one of the few European capitals who has not seen a war for five hundred years. Its cobbled and winding streets make for a pleasant walk and the many cafes make for a nice break. Watch for the changing of the guards, every day at noon. During summer, the guards are often on horseback, which makes it a bit of an extra show. After the changing of the guards, take the small ferry across the bay to the Djurgården island. This is where you will find Skansen, world-renowned outdoor museum of Swedish folklore, housed in historic buildings which have been moved here. It also doubles as a zoo. The island is also home to both the Vasa Museum, where a ship built during the 17th century that sank into the mud of the Stockholm estaturary is preserved, and the Nordiska Museet, a museum of ethnography that focuses on the lives of people centuries ago. Close by is Junibacken, a must-see for anyone with kids, a storybook interactive museum with exhibits from the treasury of Swedish children’s picture books, and a ride in homage to Astrid Lindgren, of Pippi Longstocking fame. The city has several hotels with a well-deserved reputation for great service, including the Grand Hotel, generally considered the best hotel in Sweden. But for the visitor, boutique hotels are more interesting. If you are a large family, short term rentals make for an economical alternative to hotels. As a family, you are probably best off renting a house or family apartment, which will take you some distance outside the city center. If you rent an apartment, stay on the islands closest to the center (Kungsholmen or Södermalm).